After a tense winter recess, Chasity Parker, Malajia Simmons, Sidra Howard, Emily Harris, and Alexandra Chisolm return to Paradise Valley University to finish out their sophomore year. It doesn’t take long for their problems from last semester to spill into the new one. Malajia throws caution to the wind and gives a questionable love interest another chance. The promising new relationship soon becomes filled with jealousy and disrespect. Refusing to give up and ignoring all voices of reason, Malajia winds up losing more than she bargained for. After finally coming to terms with her true feelings for Jason Adams, Chasity realizes that she must face her fears and tell him the truth, or risk losing him. If that weren’t hard enough, Chasity unexpectedly comes face to face with her birth mother. Learning the shocking truth about who her parents are, Chasity is forced on an emotional roller coaster she is unsure she will ever get off of. Sidra is desperately trying to keep her stress-induced temper in check. But when problems with her messy neighbors intensify, Sidra is forced to reveal her angry side as she takes matters into her own hands. Emily’s growing need for alcohol to cope with stress is pushing her further into a state of depression. When her grades continue to take a nosedive, her mother’s threat of a school transfer becomes imminent. Defeated, Emily fears that if things don’t change, she will lose both her independence and sanity. The new semester brings forth rising tensions. Hurtful words are taken in and harsh truths are dished out. However, the girls learn that no matter how bad things get between them—when it matters—they have each other’s back. If they hope to survive this next phase of college life, they’ll have to. 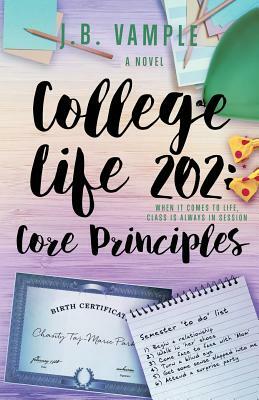 Tell us what do you think about College Life 202: Core Principles (The College Life Series, Vol 4).